This is one of my favourite Chinese starters, and it’s really easy to make. It’s always a crowd-pleaser at parties, since it works pretty well as fingerfood too. This recipe calls for silken tofu, which can be found in most Asian supermarkets. 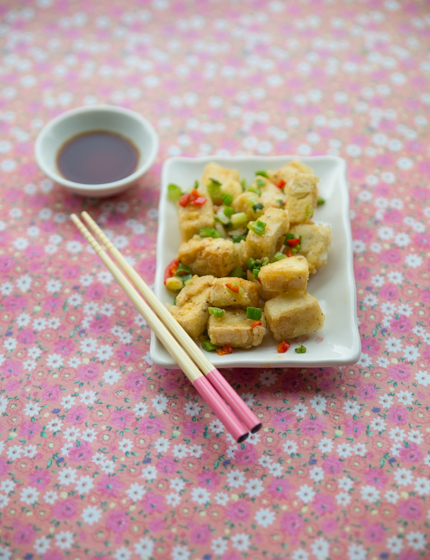 It works marvellously well in this recipe since its texture is softer than regular tofu. If you want, you could also replace the tofu for squid. Gently pat the tofu with kitchen paper until most of the liquid has been absorbed. Cut into bite-sized chunks. Finely chop the spring onions and the chilli. Crush the garlic cloves, and set aside. Put the cornflour onto a shallow plate and season generously with salt and pepper. Turn the tofu in the cornflour. Cover the bottom of a frying pan with sunflower oil and put over a medium heat. Once the oil is hot, drop the tofu cubes into the oil. Fry for approx. 5 minutes, tossing regularly, until they turn golden and really crisp. Remove and put onto a piece of kitchen paper. Discard the oil from the pan and put the sesame oil into it. Place over a medium heat and fry the spring onions, chilli, garlic and ginger for a minute, until the spring onions start to soften. Take off the heat, put the tofu back into the pan, toss in the chilli mix and put onto a serving plate. Serve with soy sauce. A little too salty. Less salt and pepper probably about a teaspoon and a half.. Firm tofu is better as silken falls apart. Less cornflour as well since it gets too gooey. You need to get the water out of the silken tofu so the coating of cornflour doesn’t get soggy. I deep fry them instead of shallow fry. I leave the salt out because soy sauce is salty enough for me. Yes, deep frying is a great option if you have a fryer. And salt is always a personal preference, I kinda like this dish salty as I eat it with a side of Chinese greens, which mellows the saltiness… Thanks for the feedback!